As homes and commercial properties sustain water damage following natural disasters such as heavy storms and floods, it is important to address the situation as soon as possible with proper water damage restoration services to restore your home back to its pre-damaged condition. When flood cleanup is not attempted in a reasonable time frame, mold may set in and cause unpleasant and disturbing health symptoms. 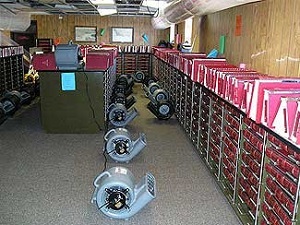 Each water damage removal and restoration project is unique with its own scenarios, but the universal idea behind successful flood repair jobs is that complete and thorough drying must be achieved before any rebuilding can be attempted. As a homeowner, you need to be aware of how to protect your home in a flooding situation. 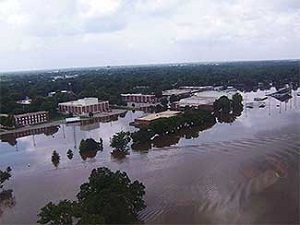 Depending on flood risks in your area, there are several options you may want to consider, some of which are fairly easy to implement and are not costly, while others may require professional flood damage restoration services. Sealing low windows, installing drainage systems, building levees and flood walls, elevating buildings or moving them away from floodplains are all options you may want to consider, depending on your budget. While you weigh your options to minimize water flood damage in your Colorado home, be aware that some of the methods may require building permits. Flood damage may be inevitable in certain situations, but you may be able to mitigate and manage the effects of the flooding by some protective measures. Are electric switches and outlets located above projected flood waters? The height of the electric panel board in your home is regulated by a building code and must be a minimum of a foot above a potential flood elevation for your house. If it is not, call a licensed electrician or a licensed flood damage contractor to elevate all your electric outlets and wiring at least a foot above potential flood damage elevation for your home. Is your sewage system prepared in case of potential flooding? Installing a floating floor drain plug would help a flood damaged home in when the drain pipe backs up. In case of flood water entering your sewage system and causing sewage to back up into your home, it is best to install a back-flow valve. Check with your flood damage contractors for permit restrictions. Do you have flood damage insurance? If you live in a flood-prone area, it is not enough to take care of the above flood damage options. Those options may minimize the flood damage to your home, but since homeowners' insurance policies do not cover flood damage clean up and flood damage repair, you should consider buying a separate flood damage insurance policy under the National Flood Insurance Program (NFIP). What can I expect from a KW Construction and Restoration? When you call KW Construction and Restoration to dry and repair your water damaged home, we will come prepared to begin working right away. 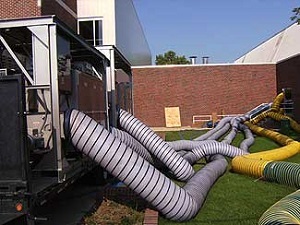 Our industrial strength equipment is in place and we are ready to help you tackle your emergency cleanup and repair. We have certified restoration technicians who are are on call 24/7 to respond to you and they are trained to immediately work on any flood water clean up, repair damages and mitigate flood mold situation as time is of the essence. Remember that flood removal, damage clean up, and repair need to be done in a timely fashion to minimize repair costs.